Its time to turn up the volume. Loud and clear. The newly renovated W Atlanta- Buckhead is rising above the rest and pressing its polished fingernails into the wet cement to make its mark known. With the recent completion of a 20-million-dollar revamp, moderation is not in its vocabulary and it will push all the boundaries. Updated guestrooms add a pop of vibrancy and a connection to the city. Experience all of the action in the hotels distinctive restaurants and bars, including Whiskey Blue, Buckhead's hippest rooftop bar which beckons from the 12th floor, hang out in our Studio 11 designed Living Room or tempt your taste buds in our signature restaurant, Cook Hall. See and be seen in front of four custom murals strategically placed throughout the hotel that feature Atlantas top visual artists. Reenergize with a workout in FIT or soak up the sun on our WET deck, with the only infinity-edge pool overlooking Buckhead and unique happenings. Cook Hall: Indulge your taste buds with elevated comfort cuisine in our Buckhead restaurant. This unique & modern gastropub, where hand crafted cocktails are stirred, brews are drawn & small plates are passed, encourages our guests to share, engage and mingle. The Living Room: Enter the Living Room, where we've transformed the traditional lobby into a space designed for socializing. Start your day here with freshly prepared items at the W Grab and Go, then relax with light bites and cocktails as you soak in the Buckhead scene. Whiskey Blue: Mix and mingle under the stars at our Atlanta rooftop bar, Whiskey Blue. 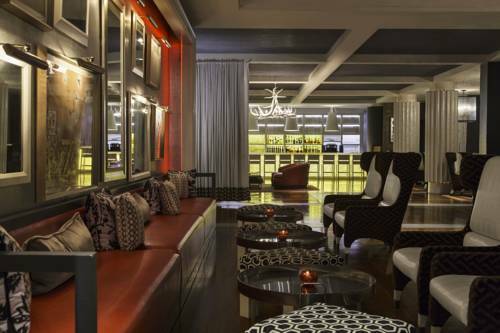 One of Buckhead's premier lounges, Whiskey Blue offers the glamour of the city, craft cocktails and spectacular views of the city.